During the Second Seminole War, James Thompson and his black assistant Aaron Carter, were at Cape Florida Light on Key Biscayne. They didn’t expect the Seminole attack. 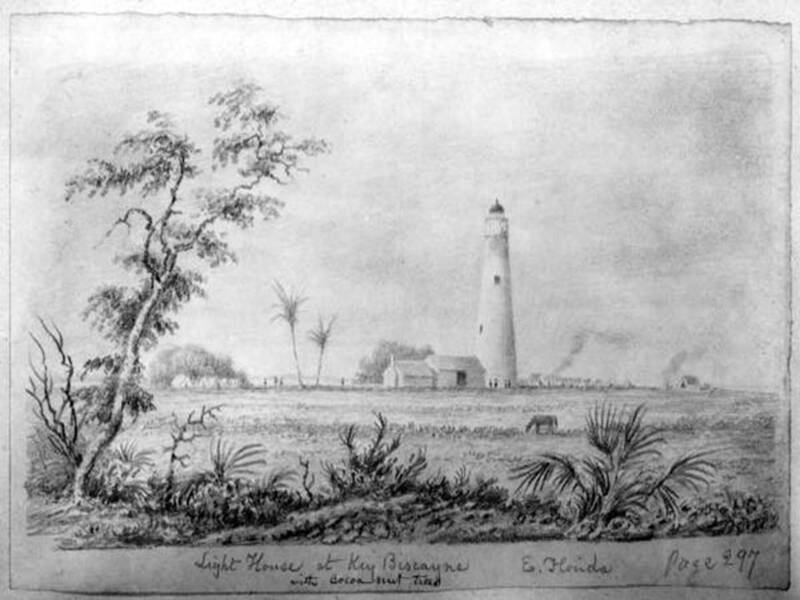 Only July 23, 1836, at about four o’clock in the afternoon, Seminole Indians surrounded the Cape Florida lighthouse, howling and waving rifles. Inspired by Chief Osceola, the Seminoles were attempting to drive the Americans off of their Florida lands. .Assistant Keeper Thompson spotted the Indians as he walked the path from the kitchen shed to the main house. He ran for the lighthouse, shouting for his assistant, some versions of the story say his slave, Aaron Carter, to follow. The Seminoles fired a shower of rifle balls, but neither Thompson nor Carter was hit. They reached the safety of the lighthouse and locked the door behind them. Next, the Seminoles set fire to the lighthouse. Soon the flames worked their way up the inside of the tower and burnt the wooden staircase. Thompson and Carter were in danger of being roasted alive, so Thompson decided to take desperate measures. He hauled a keg of gun powder, an axe, some loose shot and one of his muskets to the top of the tower, leaving Carter below to guard the door. Thompson grabbed his axe and ran to chop the stairs. He called Carter to help him and together the two men chopped through the timbers holding the staircase. It collapsed with a crash, providing a pile of extra fuel for the fire. Fed by the extra wood, flames roared up the shaft under the lantern room. Thompson and Carter inched their way to the edge of the lantern platform which measured about two feet wide. Flames licked at the lantern and its lamps and the glass burst and flew in all directions. The clothing of the two men caught on fire. Still, they couldn’t move away, because as soon as they stood up they would be clear targets for the Indians. Then Thompson decided that a quick death was better than being slowly roasted. He and Carter slid over, pushing the powder keg ahead of them. They reached the scuttle and opened it. They threw the powder keg into the fire below. There was a deafening blast and the tower shook from top to bottom. The force of the explosion extinguished the fire for a few minutes and piled up more wood at the bottom of the shaft. Revived by this new fuel, the fire soon started up again. Dense clouds of smoke billowed up into the lantern room, and the temperature soared. Aaron Carter decided that he didn’t want a slow, fiery death either. He stood up. A bullet whined and Carter slumped over and lay still. Keeper Thompson crouched alone. He discovered that no matter how small he tried to make himself, his feet stuck out. Bullets hit his right and then his left foot. He pulled himself up and climbed outside the iron railing that surrounded the platform and stared at the Seminoles below. He decided he would leap head first down onto the rocks rather than let the Seminoles get him. He started to jump, and then a premonition made him lay down again. The next morning, Thompson watched the Seminoles take his belongings from the base of the lighthouse to the beach where his sloop lay anchored. They loaded the sloop with booty and sailed away. Thompson estimated there were about 12 Seminoles in the sloop. Other Seminoles hiked along the shore, obviously planning to meet the sloop at the other end of the island. According to Thompson’s watch, it was 10:00 o’clock before the last Seminole left the island. As the sun rose higher in the sky, Thompson’s perch grew hotter, but he couldn’t escape. He was stuck at the top of the lighthouse, because he had destroyed the stairs. His assistant Aaron Carter, lay dead beside him, and he had no way to summon help. About noon, Thompson thought he saw a sail near the beach. He took a piece of Carter’s blood soaked trousers and pulling himself up to a half standing position, he waved the trousers vigorously. The sail passed out of sight. Late that same afternoon, Thompson saw two boats approaching, but he was too tired to wave the trousers again. He watched one of the boats come right up to his mooring and he saw that a group of men in a sloop was towing his own boat. They put in at his landing and for a horrible moment, Thompson thought the Seminoles had returned. Then he saw that they were white men. Thompson shouted weakly and held the trousers up in the air. The wind caught them and flapped them loudly enough to catch the men’s attention. The men surrounded the lighthouse tower. They shouted to Thompson that they were returning to their ship for the night, but they would be back in the morning to rescue him. The next morning the men returned and one of them carried a kite. The man tried to fly the kite across the top of the tower to get a line to Thompson, but he couldn’t get the kite high enough. Next, the man fired a musket with twine attached to the ramrod. The twine reached Thompson and he tied it to the tower. A tail block was hauled up and fastened to the lantern room around the iron stanchion. The men threw up a two inch rope and two of them climbed it, They treated Thompson and lowered him to the ground. Captain Armstrong and a detachment of seamen and marines from the United States schooner Motto rescued Assistant Keeper Thompson and retrieved Aaron Carter's body.The men took Thompson to Charleston, South Carolina, to recover from his wounds and he returned to the lighthouse service. The Seminoles continued to fight and gradually withdrew deep in the Everglades to avoid being sent to reservations in the western United States. Many of them still live there. Brooklyn Eagle, July 29, 1851.